I rarely cook fish at home since I'm too afraid of messing it up. Recommendations for easy fish recipes are welcome. (especially non-salmon dishes since B doesn't like salmon.) This one was easy to prepare and tasted pretty good although it didn't look very pretty. I served it with Bahia Butternut Mash. The drink in the background is a Malibu Bay Breeze. I included that drink recipe too. Oil a glass pan with 1 Tbsp olive oil. Pour 2 Tbsp lemon juice over fish filets in pan. 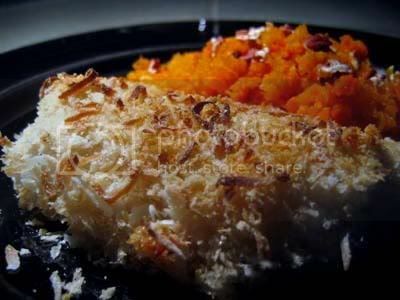 Combine 1/3 cup coconut flakes and 3/4 cup panko and then sprinkle generously over fish. Bake 15-25 minutes until done. Build in a highball glass and garnish with the lime wedge. Variation: Pour 1 1/2 oz Malibu rum in a mixing glass. Add 1 oz each of pineapple and cranberry juices. Shake it very hard until the pineapple juice makes nice foam on top, then strain it into a chilled martini glass. Grate fresh nutmeg on top. I love coconut too! But B doesn't like coconut either so I don't cook that often with it. Then again, yesterday, I made 2 loaves of banana bread, customized to our preferences. Mine added dried grated coconut. His added dried cranberries. Both of us quite happy. Well done on the photo. I'm always so worried that I'll either dry out fish or won't cook it long enough - it's something I'd like to work on too! Fish cakes (I make these the easy way, just using a tin of boneless, skinless salmon - I'm not the biggest salmon fan either, but it tastes good in fish cakes - leftover mashed potatoes and an egg. Mix together, season with salt and pepper, form into patties and cook in a pan sprayed with oil. You can also roll in breadcrumbs before you fry them, and adding a bit of crushed feta cheese or parmesan to the mix is tasty too). Dill and Lemon Fish Filo Parcels. oh wow...lots of good ideas here. I especially like the idea of fish cakes though I wonder if it would give the frying smell that my boyfriend hates. I like the sound of the Fisherman's Pie too. When it refers to 'reduced-fat spread' are they referring to butter? And I actually don't do well with either digesting or smelling heavily fried foods either, but I find that you don't get that smell if you just fry the fish cakes in a sprayed pan rather than with lots of oil. Or you can bake them. If I'm feeling lazy and don't feel like washing a pan, I just put them on a cookie tray, spray the tops with oil and bake them in the oven for ten minutes until they go golden. I usually do the suggested variations with the pie by the way, and added chopped hardboiled eggs and cover the top with mashed potato and a bit of cheese instead of the bread. That fish sounds like it'd be really good, but I'm really suspicious of fish because I've eaten cod before and it had heaps of bones in it... I do like salmon and stuff like shark though. Maybe I could use this recipe but use shark? I don't mind fish bones as long as they're big enough to spot and spit back out. My favorite fish dish is Steamed Flounder with Ginger and Scallions at Chinese restaurants. So good. But yeah...watch out for those bones. I don't think I've ever seen shark for sale. Would mahi mahi be another good meaty fish that doesn't have much in the way of bones? 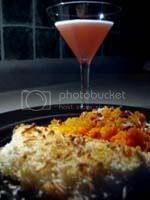 I use to make this white fish in a lime mango salsa. From what I remember you marinated the fish in the salsa and then only lightly cooked it. Shame I can't remember anything else about it other than it was really good. After a quick search I think this might have been the recipe. I'm glad you found that recipe because that does indeed sound delicious! Make sure the fillets are thawed. The recipe does work when they're frozen, but the time in the oven is longer. Melt the butter on the stove in a small pot, mixing with the garlic, parsley salt, pepper and paprika. Spread roughly 1/2 of the mix on the bottom of your baking dish. Put the fillets on top, then pour the rest of the mixture on top of the fillets. Bake in a 350F oven for 12-15 minutes, until the fish flakes when forked (my favorite phrase). Very tasty!! :) I usually serve this with risotto. Baked fish sounds like the way to go. Thanks for the recipe! The fish sounds wonderful and so does the drink. I have never heard of coconut flakes before. I think I had coconut left from making Island Macaroons. Easily the best use of coconut flakes that I've made. I really want to try it. Where do you get coconut flakes? Would a regular market like Stop&Shop have them? yeah... Regular grocery stores should have them. I think I found it in the baking section along with the chopped nuts and chocolate chips. Are shredded coconut and coconut flakes the same thing? I don't know if you eat fried fish at all but I LOVE fried haddock. I LOVE fried fish but tend to only order it when I'm eating out. Fish and chips -- yum! I love fish and chips too but it's different done this way. I don't know what prompted me to try the seasoned Italian breadcrumbs but it works. 3. It's practically fool proof. There's less chance you'll burn it or dry it out. From there, you can use all sorts of recipes for marinades, sauces, and glazes to compliment your fish of choice. That often? Wow. So when you say fish cooks quickly...how long is that? Less than 10 minutes in the broiler? My fear is that I'll undercook the fish and poison myself or else overcook it and make it all dry and yucky. I like anything with coconut.